Florida is once again a battlefield in the great Republican civil war, and nowhere is the Republican establishment putting more resources into the battle than in the special election primary in Congressional District 19. Arrayed on one side is outsider Curt Clawson, a former Purdue University basketball standout, corporate CEO, who is strong on life and is an inspired advocate of a Ronald Reagan – Jack Kemp-style of optimistic growth-oriented conservatism. On the other side are State Senator Lizabeth Benaquisto and former state Representative Paige Kreegle, two creatures of Tallahassee’s lobbyist driven political culture, and the contrast could not be more stark. 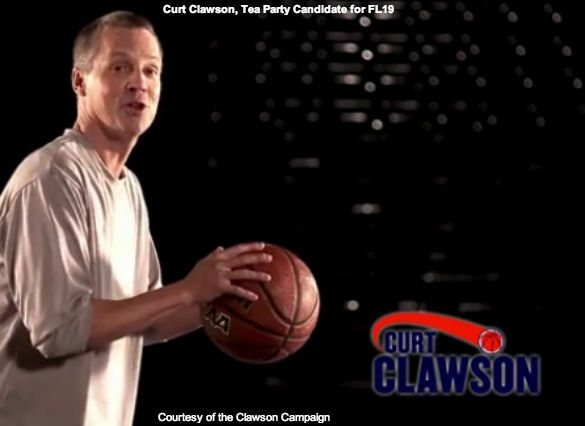 You would think that a business guy like Curt Clawson would be the candidate of all the Florida and national business interests; but if you did, you’d think wrong. Clawson began his campaign by announcing that he was running to defend the Constitution and to work for a pro-growth economic agenda that would encourage and sustain a real economic recovery. Clawson subsequently released a 22 page document detailing what he calls his “5% Economic Growth Plan.” In a state still reeling from the disaster of Obamanomics you would think that Republican primary voters would expect, and deserve, something similar from Benaquisto and Kreegle. While Curt Clawson has presented a plan to lead America out of the stagnation of Obamanomics, that has left us with $17 trillion in debt and 2% GDP growth, his opponents have said practically nothing about jobs, economic growth and the economy. Indeed, Curt Clawson’s opponents have ignored these issues despite the fact that Gallup tells even provincial career politicians like Benaquisto and Kreegle that the top issues to American voters today are the economy, the Nation’s finances and debt, and jobs. And true to form for career politicians who have been raised in the insider culture of today’s Republican politics, instead of proposing their own pro-growth economic plans, Benaquisto and Kreegle have run Romney style negative campaigns attacking Clawson with patently false accusations about the decisions he made while leading a multi-billion dollar corporation back to profitability after the meltdown of 2008, and being the world class leader in its industry we might add. But as important as the speeches and the who is in favor of what in the campaign may be to some voters, the real issues in this campaign aren’t the pros and cons of the bills before Congress this week – they are leadership, vision and character, and that is where Curt Clawson really outclasses his opponents. Clawson has proven himself to be a man who will make tough decisions, and he has proven himself to be a man of impeccable character. And let’s be clear, to solve our Nation’s problems and to undo the damage that six years of Obama as President has wrought, it will take men and women of impeccable character making tough decisions. And that’s the problem with today’s Republican establishment. It’s not that go-along-get-along politicians like Paige Kreegle and Lizabeth Benaquisto and the House Republican leadership lack ideas and plans; it is that they lack the leadership, the guts, the character to make the tough decisions everyone knows must be made on spending, on the deficit and the debt. Paige Kreegle and Lizabeth Benaquisto may be right on some issues of concern to conservatives, but conservatism is a fully formed world view about the relationship of citizen and government – it isn’t a smorgasbord where you can belly up, pluck off a meatball or two and claim to be a conservative. There’s only one candidate in the Florida Congressional District 19 Special Primary who has expressed to us that fully formed conservative world view, who will stand strong for the Constitution and who is prepared to be a leader who will broke no compromise in its defense, and that’s Curt Clawson. As a voter in FL-19, and one who has fought for the conservative agenda from City Hall to the White House, I’m proud to support and endorse Curt Clawson for the Republican nomination for Congress in FL-19. Click here to learn more about Curt Clawson or to volunteer or donate to his campaign.